On Monday 23 March there will be a workshop and learning event for Stockwell organisations on Community Buildings in Stockwell, organised by the Stockwell Partnership. How can we improve our buildings? How can we work together more? Can we share some of the management tasks? Are there common issues we should work together on? 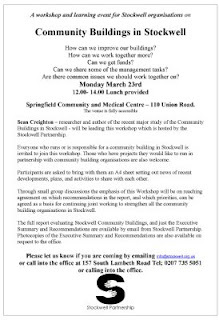 Sean Creighton – researcher and author of the recent major study of the Community Buildings in Stockwell - will be leading this workshop which is hosted by the Stockwell Partnership. Everyone who runs or is responsible for a community building in Stockwell is invited to join this workshop. Those who have projects they would like to run in partnership with community building organisations are also welcome. Participants are asked to bring with them an A4 sheet setting out news of recent developments, plans, and activities to share with each other. Through small group discussions the emphasis of this Workshop will be on reaching agreement on which recommendations in the report, and which priorities, can be agreed as a basis for continuing joint working to strengthen all the community building organisations in Stockwell. The full report evaluating Stockwell Community Buildings, and just the Executive Summary and Recommendations are available by email from Stockwell Partnership. Photocopies of the Executive Summary and Recommendations are also available on request to the office.